An everyday lorry driver has been arrested after a serious crash involving a minibus in which one woman was pronounced dead and 18 people injured, five of them severely. 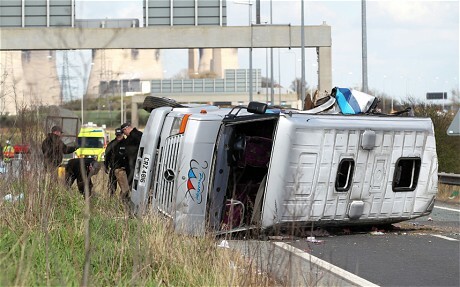 The collision occurred on the westbound carriageway of the M62 nearby Pontefract at around 11:30am. Rescuers were working hard to free those whom remained trapped, West Yorkshire police said. The minibus was believed to have been carrying a group of around 20 women, all from the area of West Yorkshire. Police, firefighters, paramedics and at least six air ambulances were scrambled to the scene of the accident, which caused extensive travel chaos and tailbacks. Police stated that the motorway was closed in both directions and advised all motorists to avoid the area. 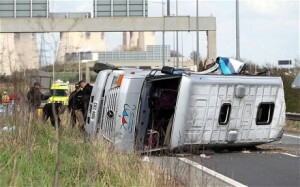 A spokesman said the driver of the lorry has been arrested in connection with the collision. Due to the amount of damage caused to both vehicles, a fully comprehensive lorry insurance policy is vital. A spokeswoman for the Yorkshire ambulance service said: “We received an emergency call at 11.31am today to reports of a serious collision between a mini-coach and an HGV at junction 32 of the M62, close to Castleford, West Yorkshire. Kevin Hodgson, its director of operations, said they had sent two air ambulances, which were joined by two from North West Air Ambulance and another two from Lincolnshire and Nottinghamshire Air Ambulance. He said one helicopter had already landed at Leeds General Infirmary and one was en route to the James Cook University Hospital in Middlesbrough – each with one patient on board. “We do not know the exact state of the injuries, but certainly the patient en route to the James Cook hospital was anaesthetised on scene by the doctor and paramedic,” he said.